The Basement Ep. 1: Welcome Back Laurier! MEET THE NEW TEAM ! 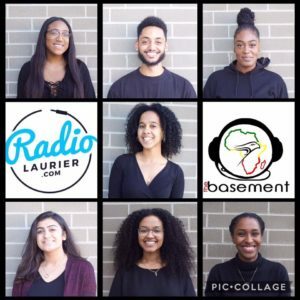 This week, The Basement kicked off its first show of the year, introducing the new team to the world! The show started off with the team sharing some of their embarrassing childhood memories including Brianna’s horrid experience with Nair hair removal products, and Lydia’s unfortunate experience throwing up in front of people. The team also shared their experiences thus far as post-secondary students. We asked our audience to share their experiences and transitions through the trials and tribulations of post-secondary education. After kicking off the show, we introduced a breathtaking track-list remixed by our lovely DJ Marium. Shout-outs to the underrated female DJs, we see you doing your thing Marium! The show then took a turn into the heavy hitting topic of the NFL and the politics surrounding the Take a Knee protests that have been sweeping the nation (USA, USA!). The POTUS as we discussed, certainly does not commend the actions that many Americans have taken to defend their rights. Our question to the president then is, what are YOU doing to protect the wonderful American citizens YOU claim to represent? After another poppin music break we continued the discussion on the recent Las Vegas shooting and the social implications that were revealed through the medias way of presenting the shooter to the public. None the less plenty of lives were disrupted by this tragic event and our thoughts and prayers are with the families that have been affected. DJ Marium lightened the mood with some throwback tracks, taking the audience on a nostalgic trip through the 90s. This was followed by a hilarious final topic on the disputable argument of double standards. We asked, is it possible for you to have friendships with other genders while being a relationship? Our audience certainly had some input on the topic. Our final track-list highlighted some of todays most popular music in the industry, which lead us into our final goodbyes for the week. Tune in next week for another great show with our passionate crew members. Remember to always stay real folks! Episode One Recap: In case you missed the show!